3 minutes and 30 seconds. The average length of a song. But what goes in to making that three and a half minute song, you ask?! Hours, days, weeks, and months, of hard work and preparation from the writing room to the studio. Ever wondered what goes in to making a record?! I am going to give you a behind the scenes look from my personal experiences! We’ll start at the beginning- the songwriting process. For the most part, writers usually sit down with one or more co-writers to create a new song. When you have multiple brains in the room, you can bring all sorts of different ideas, lyrics, and creativity to the table and it’s a beautiful thing! Usually you begin with a melody, and build your lyrics around that melody. Other times, you begin writing the lyrics, and create a melody around the lyrical content! There is no right or wrong way.. it’s just a matter of preference! Once the song is created, we make what we call “work tapes” which are basically a scratch reference of the song! If you are making a record, the next process after you have the number of songs you want to record, is to take those scratch tapes to the studio! (This is the fun part!!) At the beginning of this year myself and my co-writers, Adriene Smith, Phillip White, and Dave Fenley, decided to take our newly written songs to the studio! We decided that Phillip would be the producer of this new music, so he set out to find the perfect musicians to play on the record! Once he got the studio musicians nailed down, we scheduled a few days at Loud Recording Studios here in Nashville! On day one, we tracked all of the music to the songs. Each player (i.e. : drummer, bass player, guitar players, etc) were given the charts (chords) to each song, listened to the before mentioned work tapes, and then went in to their specific rooms to track the songs! During that time, I went in the vocal booth and sang “guide vocals” for them to play off of! Each musician played their particular instrument at the same time as the others, and it really creates a “band feel”! After a long, LONG day… we completed step one! Day two, and it was time for me to sing the lead vocals on each song. Usually, the lead vocals are done in a room by ourselves.. with just us, loads of water, honey, and lays potato chips. (lol.. coats the throat!!) After different takes, we move on to the next song… and so on and so on. After finishing the lead vocals, we would come back the following week to do background vocals. Some artists use other singers to do their background vocals, but as for me.. I usually prefer to do my own! After all, nobody knows your voice like yourself, right?! My mom says she wants to do them for me one day.. but well, probably won’t happen, Mom! Still love you though! :) Background vocals are also known as harmonies. These are always SO fun to me and add so much warmth and depth to songs! After days and days in the studio getting all of the layers you want on each particular song, they are then turned over to a mixing engineer who edits and mixes each particular instrument/the vocals to make everything sound amazing and mixed together very well. Kind of like mixing cake batter.. if you don’t mix the cake batter correctly and smoothly, the cake may turn out lumpy.. and just not right. Same goes for mixing songs! 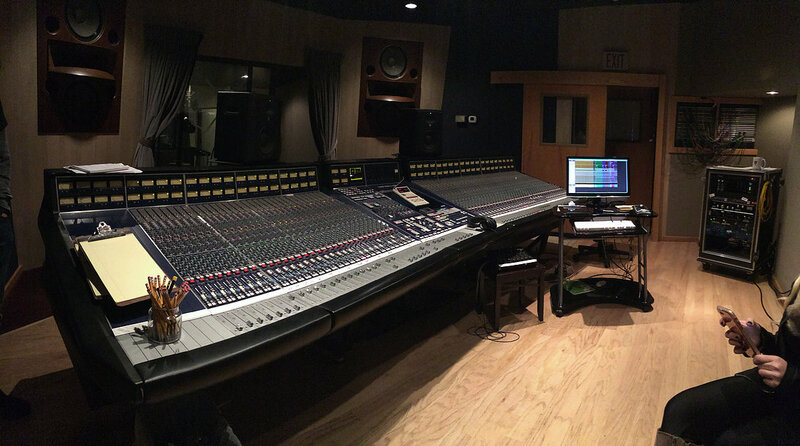 After the mixing process is completed, the final step is to “Master” the songs/record. Mastering is basically the process of preparing and transferring the songs from a source containing the final mix to a data storage device (the master) ; the source from which all copies will be produced (via methods such as pressing, duplication or replication). Sounds a little complicated, but its what enables us to get our cd’s replicated in bulk, and a “finished product” so to speak! Hope you all enjoyed getting a little behind the scenes look at what goes in to making a record, and I also hope you enjoy these exclusive studio pictures and video!